After the interview. Photo by Johnn Mendoza. Cebu Bloggers Society Inc. celebrated its 10th year anniversary on Feb. 14, 2018. The group will commemorate the happy occasion on Mar. 3, 2018 when members will gather together for the Cebu Bloggers Society 10th Anniversary Gala Night, the group’s largest event yet. Here’s the list of brands and companies who trusted and continued to do so Cebu Bloggers Society’s ability to help them grow. 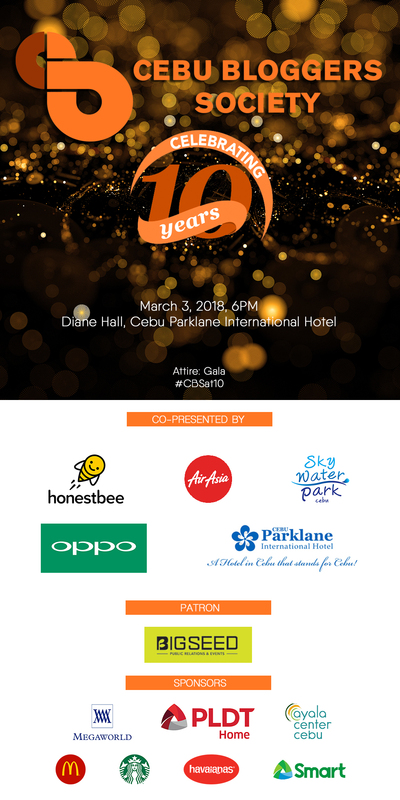 The Cebu Bloggers Society 10th Anniversary Gala Night is co-presented by Cebu Parklane International Hotel, our official venue partner, AirAsia, our official airline partner, SkyWaterpark Cebu, our official waterpark partner, and Oppo, our official smartphone partner. Have some cravings? You can now order your food and groceries online with honestbee. Just download the app and have them delivered at your doorstep.